People in Ireland are sometimes mortified by what Americans think of as “Irish food.” That’s because the real thing is much subtler and more delicious than any platter of overcooked corned beef and mushy cabbage could ever be. 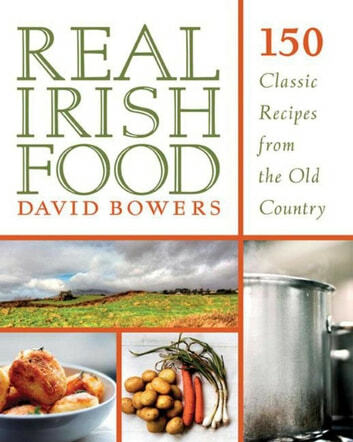 Real Irish food is brown soda bread so moist it barely needs the yolk-yellow butter; fragrant apple tarts with tender, golden crusts; rich stews redolent of meaty gravy and sweet carrots; crisp-edged potato cakes flipped hot from a skillet directly onto the plate. Forget meatloaf or mac and cheese—this stuff is the original comfort food. Real Irish Food is the first comprehensive cookbook to bring classic Irish dishes to America with an eye for American kitchens and cooks, and with tips and tricks to help reproduce Irish results with American ingredients. Transform plain white fish by baking it with grated sharp cheese, mustard, and crumbs. Discover that celery takes on new life when sliced, simmered in chicken stock, and served in a lightly thickened sauce. From hearty roasts to innovative vegetable dishes, from trays of fresh-baked scones to rich, eggy cakes, and from jams bursting with tart fruit to everything you can do with a potato, there’s no food so warm and welcoming, so homey and family-oriented, so truly mouthwatering as real Irish food.